Basketball, UFC, boxing, baseball, football and other types of sports produce a winning or losing result, enabling one to place bets on these events. This type of gambling attracts mass appeal, particularly because there is no house or casino that might possess an unfair statistical advantage. 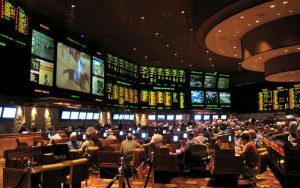 Gamblers that place these types of bets will sometimes base statistical systems off of their analyses of the game and its players, in an attempt to create a system that will allow them to win more frequently. Some of the earliest recorded sports bets were placed on gladiator fights in arenas. Sport betting systems used to consist of handwriting statistics and placing wagers based on the statistics. More recently in the United States, boxing was one the first big sporting events that had a lot of betting in which people made large amounts of money. The mob and other higher members of society were known to pay off boxers in order to make money off betting in this setting, making the bets unfair since a boxer could have been paid to throw their fight. This type of manipulation for profit is now illegal and does not occur often. More recently, technology and statistical analysis has played a role in sports betting. In the 1980s, a group of 17 individuals who called themselves The Computer Group were winning almost all the bets they placed, and it seemed as if this group was somehow controlling the system. They were not, and had instead created a sport betting system that involved using a computer to predict outcomes. In the 1980s this group had a high win percentage and was making millions thanks to statistics and computers. This gave rise to a new age of sports betting system groups using modern technology. Regression analysis is a simple type of statistical analysis commonly applied to sports bets and for other types of statistical analysis. Regressions are used to detect negative and positive correlations. In terms of sports betting systems, regression helps to compile the most useful statistics like passing percentage when it comes to winning games. Sports systems introduce a number of behaviors which are difficult to mathematically model. For instance typically football games you usually score 3 points or 7 points, so making bets that are multiples of these numbers are common; a simple regression based on scores or win rate will fail to reflect this pattern, however. “About Sports Insights.” Sports Insights. N.p., n.d. Web. 07 July 2016. <https://www.sportsinsights.com/company/>. Thomsen, Ian. ” The Story of The Computer Group.” N.p., n.d. Web. 07 July 2016. <http://www.offshorebettor.com/images/COMPUTER.htm>. Tuley, Dave. “The History of UFC Betting in Vegas, from UFC 1 to UFC 200.” ESPN. ESPN Internet Ventures, n.d. Web. 07 July 2016. <http://espn.go.com/chalk/story/_/id/16898565/the-history-betting-ufc-las-vegas-ufc-1-ufc-200-chalk>.